Alexandra Ichim, Projects Manager in Romania tells us about a recent charity show that the Projects Abroad Romania staff team and volunteers from a variety of projects, helped to arrange. 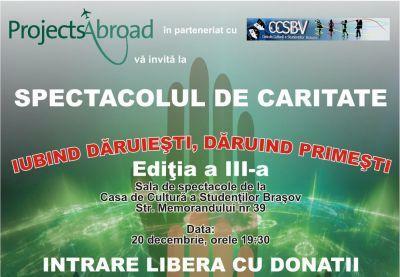 ‘On Tuesday the 20th of December 2011, the Projects Abroad Romania Team together with Rafael Fundation, in collaboration with the Students’ Cultural Centre held the 3rd Edition of the ‘To love is to give, to give is to receive’ Charity Show. The main purpose of the show was to raise funds for people with disabilities from Rafael Fundation in Codlea. The event was a real success, presenting once again an eclectic mix of drama, dance and music. The drama performances were presented by our Projects Abroad Groups: Black Juice Seniors and Juniors, who presented two of the greatest fantasy stories: “Alice in Wonderland” and “Peter Pan”. Both groups performed under the guidance of Kirsten Marien, as their trainer and director, also being directly coordinated by Alexandra Ichim, the Drama and Dance supervisor for Projects Abroad Romania. Besides the presentation of the Fantasy versus Reality Drama Show, Projects Abroad had other surprises for the local public: special guests presenting unique shows of music and dance. The special guests were: Oana Panazan, Rayana Antoneac, Ana Hornoiu and The Group ‘Traditii’, who performed songs and carols from the Romanian and international repertoire. Also, the other special guests, Step in2 Salsa Dance Group and The Group ‘Traditii’, presented performances of Latin and Romanian traditional dances. The strongest performance of the evening was a story put up on stage by the members of Rafael Fundation, created by them, named ‘Follow Your Dream’. Also, at the end of the show, Rafael Fundation with Projects Abroad held an exhibition with products designed and created by the members of Rafael Fundation themselves, which people could buy. There were two donation boxes in the room, where people could donate as much as they could. Each person from the audience received an envelope with useful information on members’ needs and costs. We’re thrilled that we raised a total of 1770 lei which is approximately 410 Euros or 340 Pounds.